This semester, I'm taking the Introduction to Academic Practice course delivered by the IAD at the University of Edinburgh. 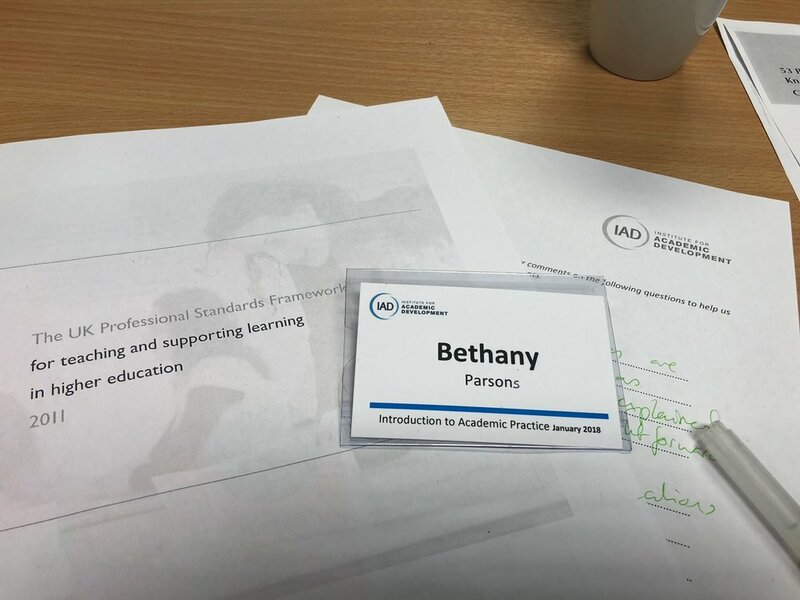 The aim is to improve my teaching by learning about pedagogical theory, widening my repertoire of classroom techniques, and reflecting on my methods and approaches to teaching. Upon passing the course, I will become an Associate Fellow of the Higher Education Academy (AFHEA). Here, I write about my journey to AFHEA. This is, essentially, a call to becoming a critically reflective teacher: one who works towards improving their practice by engaging with and incorporating information and advice from different sources, from articles and workshops to conversations with colleagues from all kinds of different disciplines. Autobiography: our own experiences as learners and teachers. What formative experiences have shaped our practice today? Students: attempting to see ourselves through our students' eyes, and taking student feedback on board. How do the students experience my classroom? Colleagues: having critical conversations with colleagues, or observing each other's practice. What is everyone else struggling with? What are they doing to improve? Theory: reading about pedagogy. What's happening in the scholarship? These lenses can help us step outside our own assumptions about our teaching practice and gain new perspectives. Thinking about my history as both a student and a teacher helps me realise why I do certain things in the classroom, and why I feel more comfortable with this activity over that. My students and colleagues are often better placed to identify where I could improve than I am - and it's necessary to be open and receptive to that feedback. Reading theory shows us how common many of our classroom experiences are, and gives evidence-based explanations for different teaching and learning styles. It is in the nature of the reflective process for us always to be evolving. We never have the luxury of regarding ourselves as fully finished critical products who have reached the zenith of reflective evolution. We see our ideas and practices as needing constant investigation. [...] At no time do we ever consider the possibilities for learning and change to be fully closed. This passage identifies the the heart of my motivation for taking this course in the first place. Just as I never consider myself as having 'finished' becoming a researcher and philosopher - in fact, I feel like I'm constantly learning new things, new approaches, and new methodology - I certainly haven't 'finished' becoming a teacher. One doesn't 'become' these things, and become a static end-product; one is always 'becoming' them. I am always becoming a philosopher, a teacher, and a researcher. Critical reflection on these processes of 'becoming' is essential. What kind of feedback would I find helpful or like to receive if I were her? What can I learn from her practice to incorporate into mine? What aspects of my own teaching practice do I want to hear the most feedback on? What can I learn from this exercise for when I conduct tutorial observations in the future? All in all, I'm quite excited at the prospect of stepping outside of my comfort zone here: both by conducting an observation for the first time, and by exploring teaching practice outside of the humanities.